Pričitajte treći dio priče o Eramusu koji su napisali učenici iz Turske. The Toads decided to go on a holiday somewhere very far away. So, they went to the airport and flew to Elfvegas. As they sat on the airplane, there was a very bad guy who didn’t like elves. He sat behind the Toads with his evil friends. When they landed in Elfvegas, the evil guys tried to steal the Toads stuff.The Toads had already found out that the guys were dangerous, but the Toads didn’t know that the evil guys were following them. At the hotel they went to bed and the next day they found out that these evil guys were in the same hotel. So, it was a very bad holiday: the evil guys were in the same hotel, the food was bad, the ocean was cold and the weather was bad too. The Toads wanted to leave Elfvegas. They decided to leave Elfvegas by airplane but their flight was late and a terrible thunderstorm hit Elfvegas. They thought that they could steal a boat and try to get back to Elfville. 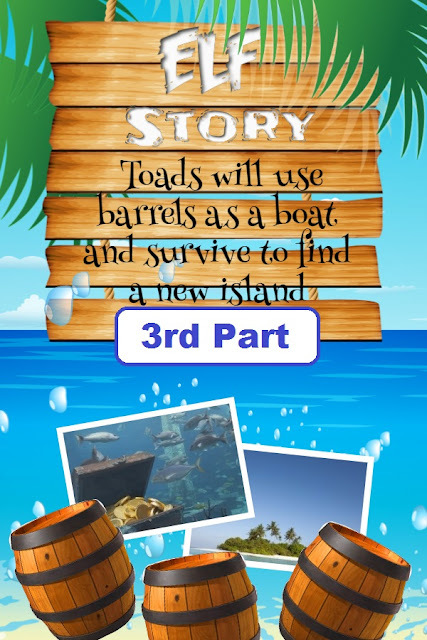 So they stole a boat but after a day’s journey, they were shipwrecked. Will they be rescued before the island totally sinks into the ocean? Koja maketa knjižnice ti se najviše sviđa? Koji crtež škole ti se najviše sviđa?